This is soooo quick and easy, I came up with it when I was searching the cupboard and freezer for something to make for the kids when we didn't have a kitchen, just a microwave. I didn't make much because Rob and I planned to have a takeaway later but it was so yummy that I regretted it after and have since made it for the whole family. It literally takes about 10 mins, or as long as the pasta takes to boil. Quantities are a bit random for this one, depending on whether you're making it just for the kids of for the whole family. This much makes enough for three hungry children plus left overs for packed lunches the next day. Get the pasta boiling (did you know, once it's at a rolling boil you can turn the gas/hob off and leave it for the the time on the pack and it'll be cooked perfectly... little money saver there for you! Although it doesn't really work for spaghetti). 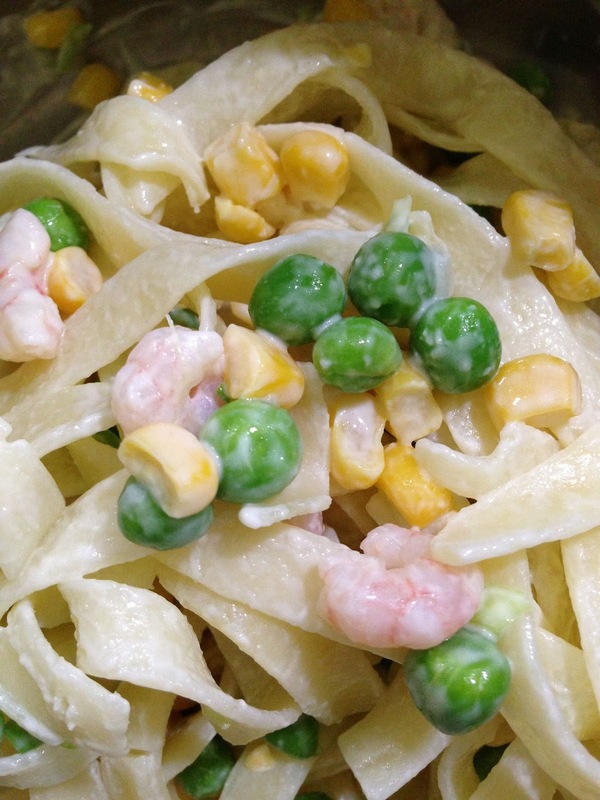 Put the prawns, peas, sweetcorn, spring onion and butter in a bowl and microwave it to defrost and warm up (if you're organised enough to defrost them earlier then well done!). If they make loads of liquid then pour a bit off. Once they are hot stir in the Philadelphia and stir into the cooked pasta. Add the cheese and serve. You'll be amazed how yummy this one is! I did not know that about pasta!